Home / Awards / Syrinxza Therapy Bar Won Gold! We are very excited to announce the Syrinxza deep cleaner & detoxifying Therapy Bar won 1st prize in the Freefrom Skincare competition. 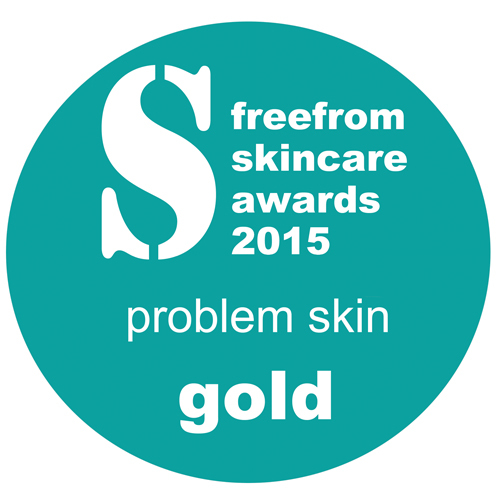 The soap was entered in the “problem skin” category and won gold, 1st prize! Skinsmatter tests the products for 1 month with outside Beauty Bible testers all of whom either have sensitive/problem skins, specific allergies/intolerances, or are simply passionate about organic and/or natural skincare. The products then go forward to an expert panel for week-long judging sessions. The panel consists of beauty writers, skincare experts, formulators and cosmetics users with problem skin conditions or an interest in ‘free from’ skincare. The judges are interested in ‘freefrom’ awareness in terms of both food allergens and other ingredients, and in manufacturers’ commitment to natural and/or organic. Using Beauty Bible testers’ feedback, they additionally assess qualities such as originality, ease-of-use, innovation, aesthetic appeal, value for money and packaging. Very importantly, they judge the product’s ingredient labelling for clarity and transparency – vital for any consumer with any kind of allergy or sensitivity, or seeking to avoid particular ingredients due to ethical or health. For more information on the Therapy Bar and to test it for yourself please visit our online shop.